Mike Manzler, associate general counsel at Wright State University, received the 2018 Ruth W. and Robert I. Westheimer Award for Continuous United Way Leadership. 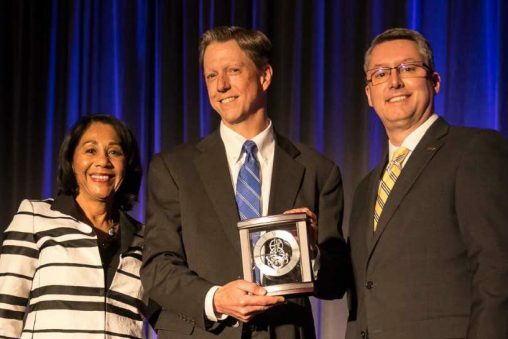 He is pictured with Yvonne Gray Washington, retired executive vice president and COO of United Way of Greater Cincinnati, left, and Thomas Vaughan, chair of the Volunteer Connection Leadership Council. Manzler was honored by the United Way of Greater Cincinnati, primarily for his service on its Human Resources Committee since 1998 and chairing the committee since 2004. The Westheimer award is given to someone who has been in long-time leadership positions for United Way and has offered outstanding leadership through a variety of activities. “I’m tremendously grateful to the United Way of Greater Cincinnati, not just for the honor of this award, but for the opportunity to have worked with and supported such a terrific organization filled with so many dedicated people for so many years,” he said. Manzler has served in several different leadership aspects for United Way. As chair of United Way’s Human Resources Committee, he has overseen and advised about the implementation of human resources policies and strategies in an effort to provide a foundation for United Way to ensure accountability and compliance with law and regulations, and to be an employer of choice. His legal background enabled him to provide legal counsel to United Way of Greater Cincinnati on labor and employment practices, personnel matters and regulatory compliance. At Wright State, Manzler represents and advises the administration, colleges and units. He counsels and represents Wright State in matters of equal employment opportunity and other human resources policies and practices, employment contracts, labor contract administration, public records requests, ethics, affiliation agreements and other contractual arrangements. Along with his work on the Human Resources Committee, Manzler is a member of the United Way of Greater Cincinnati Executive Compensation Committee. He has also served as a member of the Accountability and Services Cabinet, which supports financial transparency and compliance.